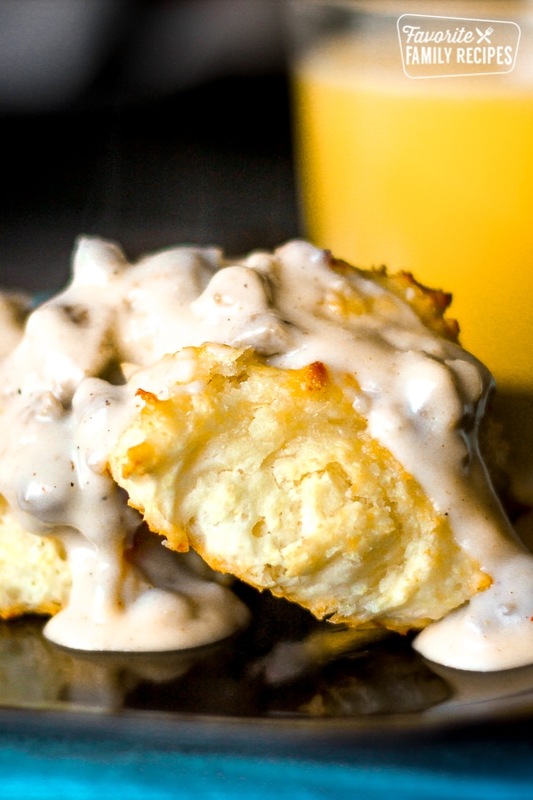 This recipe for biscuits and sausage gravy is so easy to whip up for breakfast, and it is really tasty too. It is the most requested breakfast by my kids on their birthdays. They absolutely love it. I recently made up a big batch for company and we were all fighting over the leftovers. We like to add a tiny bit of cayenne for some heat, but leave it out if you don’t like it spicy! This is a hearty breakfast, so I usually serve it with some fresh fruit that it is in season or with one of our smoothies. It is delicious served with Our Version of Orange Julius or our Banana Berry Smoothie. Cook sausage in large skillet until browned. Remove from pan and pat off excess grease with a paper towel. Return to pan and add flour, stir to coat the sausage in the flour. Then gradually add milk while cooking on medium heat. Cook and add milk until sauce is desired thickness. Add salt, pepper, and cayenne. that looks very yummy. I am not patient enough to make my own bread. I am going to try this because that looks entirely to yummy. Thanks for sharing. When I make sausage gravy everyone is tempted to lick their plate clean! I kick it up by adding dried sage (rubbed), basil, garlic powder, & crushed red pepper. Grind these with salt & freshly ground pepper (I use a motar and pestle) and add to the sausage right just before it’s finished browning (helps the spices to bloom). I also a splash (about 1 Tblsp.) of worchestire sauce to the sauce before it’s finished and I prefer to use a little half & half along with whole milk, making the sauce super creamy. Good stuff! I add a bit of cayenne to the sausage gravy. Yes, we like a bit of heat. About 4 to 6, depending on serving size. It is like an instant pancake mix. You can use a recipe for homemade biscuits (not the cookie biscuit like in England but the American “biscuit” haha, ok now I am even confusing myself).